Help give your upper body a workout with a fitness glove designed specifically for water aerobics and training. SIZING: Measure the width of your palm horizontally. *Note: Using your dominant hand, measure at the fullest part (excluding your thumb). Gloves run large. Provide excellent resistance in water. Size small fits perfectly. Great for my aqua aerobics class. Everyone is jealous. After trying various brands of aqua gloves for my deep-water workout, I found Speedo Fitness Gloves, and have stuck with them for years. Could make wrist section a bit longer. All my participants are encouraged to purchase them and since only one other store in Barbados provides them upon request, most of the people buy them from me. WIth good after-class care, they last for a good long while. The material wears off before there's any issue with the seams. Some participants, who come 2-3x/wk, still wear the same pair they bought 2 years ago. The medium was a little snug for my husband so he gave me his gloves and just ordered a large for himself. Nice gloves! 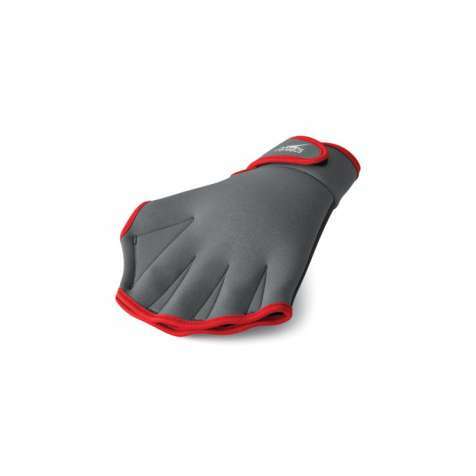 These are the best water aerobic gloves ever. Easy to put on as they have Velcro straps. Excellent water resistance while swimming to add to a better work out. I have very small hands and the small size fit perfectly! I got them to increase water resistance during exercising in the pool. They do that wonderfully. I have noticed the stitching between two of the fingers is starting to unravel, but it is still holding and will be easy to repair. The gloves have stretched a bit with time, but it is not a problem. They simply go on easier. I noted one of the reviews gave a very low score because the user preferred gloves with full fingers for use on coral reefs. 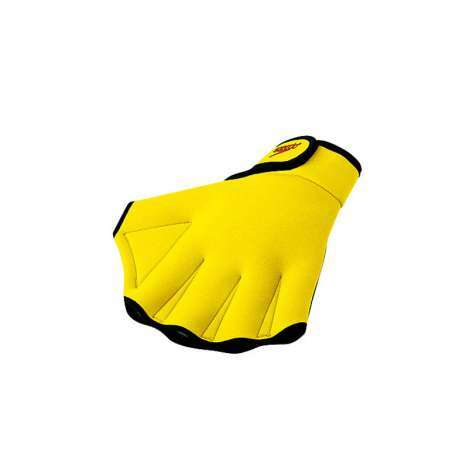 These gloves make no pretense they have full fingers, so the problem was with the purchaser, not with the glove. They are just fine for their intended purpose. They are NOT intended to protect your fingertips when you're messing around with coral or rocks. So don't buy them and expect them to do something they aren't designed to do. I have used this product for several years but have previously purchased it in a regular store. 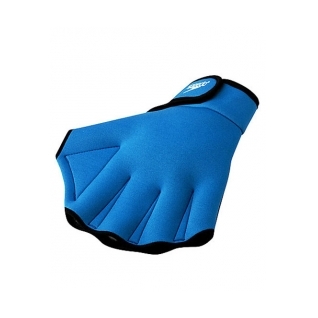 I use aqua fitness gloves to provide resistance while doing water aerobics, but they can also be used for swimming. I like the Speedo gloves because they come in different sizes (S-XL) and seem to last longer than other brands. I also like that the fingers and thumb are open at the ends. I am a daily swimmer in the ocean and do a lot of swimming in coral reefs. I found gloves that are open at the ends of the fingers are not so handy I like the closed finger tips to be safer around dangerous reef situations.